The HOTTEST Basketball product of 2014-15 (so far) has been 2014-15 Select Basketball. Select is amazing. Now close your eyes and think 2014-15 Select Basketball on steroids...... That would be 2014-15 Spectra Basketball. 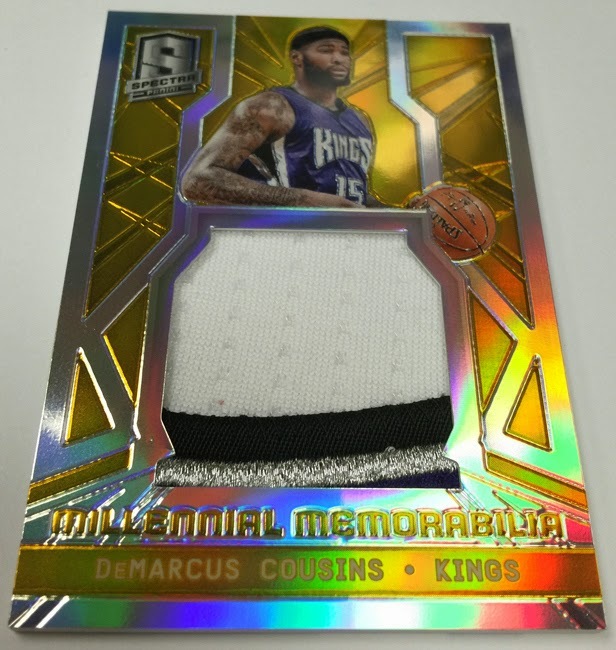 Rookie Cards with HUGE Jersey Patch pieces, On-Card Autographs, and autographed Game-Used Jersey Patches of NBA Super Stars and Hall of Famers. You're going to bust a box and want more. Arriving Wednesday is 2014-15 Spectra Basketball for $325 per box. 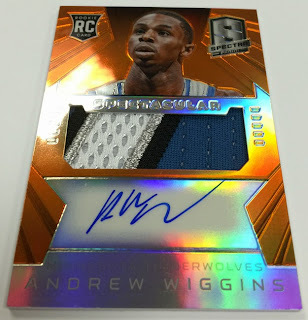 Spectra returns with the hottest rookie class in years and you will find one Rookie Jersey Autograph per box. Every signature is paired with a memorabilia swatch. 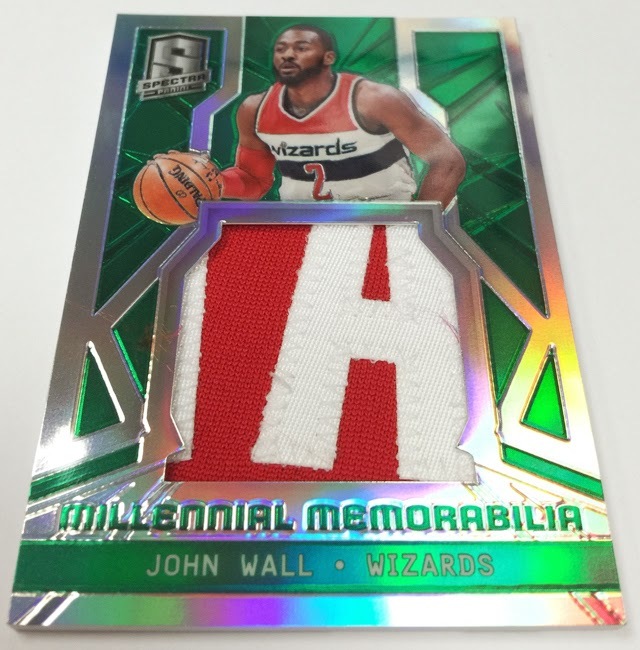 All of Spectra is printed on thick opti-chrome card stock including the rare die cuts. 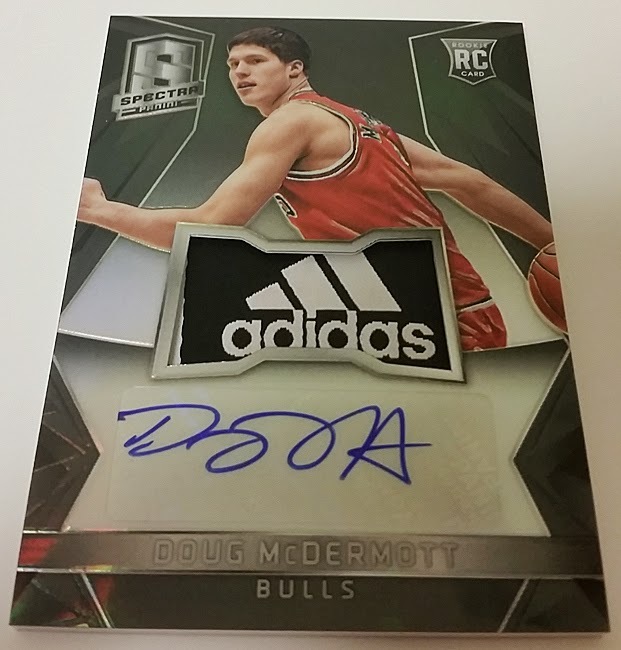 With eight cards per box which include 7 autographs or memorabilia, Spectra will be an NBA collector favorite throughout the world. Join our Wednesday (6:00 p.m.) 2014-15 Spectra Basketball Group Break for $45 per spot and EVERY spot gets one random card from a factory sealed box. Click HERE to see Panini's early break. BOX ONE had 10 cards - 2 base (#d 75 or less) 3 Jerseys/Patches and 5 Auto Jersey/Patches. BOX TWO had 9 cards - 2 base (#d 75 or less) 3 Jerseys/Patches and 4 Auto Jersey/Patches.